After a week at Ceuse, I was feeling strong, climbing well and ready to throw myself at something harder again. For difficulty, Biography sector is the obvious choice. 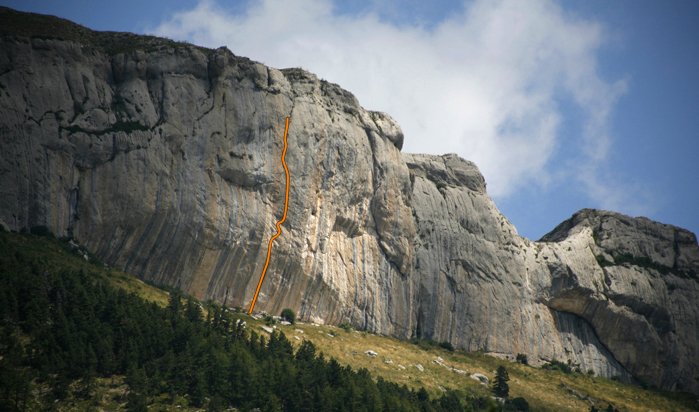 This wall has always inspired me, and since first laying eyes on it, I have dreamt of climbing one of the routes that go all the way to the top of this striking piece of rock. I chose to try “No Futur” 8c/8c+ first, but soon realised that this was out of my league and additionally it lost a lot of appeal when I realised the extent to which it had been manufactured. Thanks to some local info, I then decided to have a look at “Black Bean” 8b+, an extension to the already fantastic “Les Collonettes” 7c+. It takes a beautiful, natural line to the top of the Biography wall. Instantly this route obsessed me; it felt incredible to be able to do such amazing moves so high up on one of the most impressive rock faces I know. Quickly, I felt capable of climbing Black Bean, and to my surprise I succeeded to make the first female ascent of this epic route on my third day (fifth attempt). This route redefined the term "resistance" for me, and also tested my concentration skills over a prolonged period of time. I feel that my preparation over the last year in NZ, building up resistance since being in Europe, and learning to be a little more patient were all key factors in my ascent. It was only the second time I had taken two rest days in a row since being in Europe, and both times I sent a route at my limit on the very next day!